Arsenic is used as the group 5 element in the III-V semiconductors gallium arsenide, indium arsenide, and aluminium arsenide. 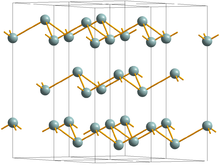 The valence electron count of GaAs is the same as a pair of Si atoms, but the band structure is completely different which results in distinct bulk properties. Other arsenic alloys include the II-V semiconductor cadmium arsenide. A large variety of organoarsenic compounds are known. Several were developed as chemical warfare agents during World War I, including vesicants such as lewisite and vomiting agents such as adamsite. Cacodylic acid, which is of historic and practical interest, arises from the methylation of arsenic trioxide, a reaction that has no analogy in phosphorus chemistry. Indeed, cacodyl was the first organometallic compound known (even though arsenic is not a true metal) and was named from the Greek κακωδἰα "stink" for its offensive odor; it is very poisonous. In 2014, China was the top producer of white arsenic with almost 70% world share, followed by Morocco, Russia, and Belgium, according to the British Geological Survey and the United States Geological Survey. Most arsenic refinement operations in the US and Europe have closed over environmental concerns. Arsenic is found in the smelter dust from copper, gold, and lead smelters, and is recovered primarily from copper refinement dust. The word arsenic has its origin in the Syriac word ܠܐ ܙܐܦܢܝܐ (al) zarniqa, from the Persian word زرنيخ zarnikh, meaning "yellow" (literally "gold-colored") and hence "(yellow) orpiment". It was adopted into Greek as arsenikon (ἀρσενικ��ν), a form that is folk etymology, being the neuter form of the Greek word arsenikos (ἀρσενικός), meaning "male", "virile". The Greek word was adopted in Latin as arsenicum, which in French became arsenic, from which the English word arsenic is taken. Arsenic sulfides (orpiment, realgar) and oxides have been known and used since ancient times. Zosimos (circa 300 AD) describes roasting sandarach (realgar) to obtain cloud of arsenic (arsenic trioxide), which he then reduces to gray arsenic. As the symptoms of arsenic poisoning are not very specific, it was frequently used for murder until the advent of the Marsh test, a sensitive chemical test for its presence. (Another less sensitive but more general test is the Reinsch test.) 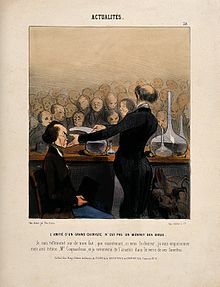 Owing to its use by the ruling class to murder one another and its potency and discreetness, arsenic has been called the "poison of kings" and the "king of poisons". During the Bronze Age, arsenic was often included in bronze, which made the alloy harder (so-called "arsenical bronze").Albertus Magnus (Albert the Great, 1193–1280) is believed to have been the first to isolate the element from a compound in 1250, by heating soap together with arsenic trisulfide. In 1649, Johann Schröder published two ways of preparing arsenic. 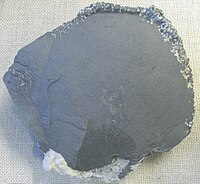 Crystals of elemental (native) arsenic are found in nature, although rare. In the Victorian era, "arsenic" ("white arsenic" or arsenic trioxide) was mixed with vinegar and chalk and eaten by women to improve the complexion of their faces, making their skin paler to show they did not work in the fields. Arsenic was also rubbed into the faces and arms of women to "improve their complexion". The accidental use of arsenic in the adulteration of foodstuffs led to the Bradford sweet poisoning in 1858, which resulted in around 20 deaths. Wallpaper production also began to use dyes made from arsenic, which was thought to increase the pigment’s brightness. After World War I, the United States built a stockpile of 20,000 tons of weaponized lewisite (ClCH=CHAsCl2), an organoarsenic vesicant (blister agent) and lung irritant. The stockpile was neutralized with bleach and dumped into the Gulf of Mexico in the 1950s. During the Vietnam War, the United States used Agent Blue, a mixture of sodium cacodylate and its acid form, as one of the rainbow herbicides to deprive North Vietnamese soldiers of foliage cover and rice. In the United States since 2006, the maximum concentration in drinking water allowed by the Environmental Protection Agency (EPA) is 10 ppb and the FDA set the same standard in 2005 for bottled water. [unreliable source?] The Department of Environmental Protection for New Jersey set a drinking water limit of 5 ppb in 2006. The IDLH (immediately dangerous to life and health) value for arsenic metal and inorganic arsenic compounds is 5 mg/m3 (5 ppb). The Occupational Safety and Health Administration has set the permissible exposure limit (PEL) to a time-weighted average (TWA) of 0.01 mg/m3 (0.01 ppb), and the National Institute for Occupational Safety and Health (NIOSH) has set the recommended exposure limit (REL) to a 15-minute constant exposure of 0.002 mg/m3 (0.002 ppb). 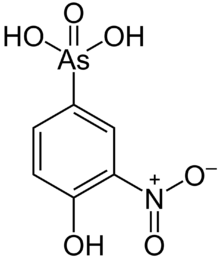 The PEL for organic arsenic compounds is a TWA of 0.5 mg/m3. (0.5 ppb). In 2008, based on its ongoing testing of a wide variety of American foods for toxic chemicals, the U.S. Food and Drug Administration set the "level of concern" for inorganic arsenic in apple and pear juices at 23 ppb, based on non-carcinogenic effects, and began blocking importation of products in excess of this level; it also required recalls for non-conforming domestic products. In 2011, the national Dr. Oz television show broadcast a program highlighting tests performed by an independent lab hired by the producers. Though the methodology was disputed (it did not distinguish between organic and inorganic arsenic) the tests showed levels of arsenic up to 36 ppb. In response, FDA tested the worst brand from the Dr. Oz show and found much lower levels. Ongoing testing found 95% of the apple juice samples were below the level of concern. Later testing by Consumer Reports showed inorganic arsenic at levels slightly above 10 ppb, and the organization urged parents to reduce consumption. In July 2013, on consideration of consumption by children, chronic exposure, and carcinogenic effect, the FDA established an "action level" of 10 ppb for apple juice, the same as the drinking water standard. ^ a b c d Gokcen, N. A (1989). "The As (arsenic) system". Bull. Alloy Phase Diagrams. 10: 11–22. doi:10.1007/BF02882166. ^ Ellis, Bobby D.; MacDonald, Charles L. B. (2004). "Stabilized Arsenic(I) Iodide: A Ready Source of Arsenic Iodide Fragments and a Useful Reagent for the Generation of Clusters". Inorganic Chemistry. 43 (19): 5981–6. doi:10.1021/ic049281s. PMID 15360247. ^ Cverna, Fran (2002). ASM Ready Reference: Thermal properties of metals. ASM International. pp. 8–. ISBN 978-0-87170-768-0. pdf. ^ Lide, David R., ed. (2000). "Magnetic susceptibility of the elements and inorganic compounds". Handbook of Chemistry and Physics (PDF) (81 ed.). CRC press. ISBN 0849304814. ^ Uthus, Eric O. (1992). "Evidence for arsenic essentiality". Environmental Geochemistry and Health. 14 (2): 55–58. doi:10.1007/BF01783629. PMID 24197927. ^ Uthus E.O., Arsenic essentiality and factors affecting its importance. In: Chappell W.R, Abernathy C.O, Cothern C.R. eds., Arsenic Exposure and Health. Northwood, UK: Science and Technology Letters, 1994, 199–208. ^ Carelton, James (2007). "Final Report: Biogeochemistry of Arsenic in Contaminated Soils of Superfund Sites". EPA. United States Environmental Protection Agency. Retrieved 25 February 2018. ^ a b Norman, Nicholas C. (1998). Chemistry of Arsenic, Antimony and Bismuth. Springer. p. 50. ISBN 978-0-7514-0389-3. ^ Biberg, Egon; Wiberg, Nils; Holleman, Arnold Frederick (2001). Inorganic Chemistry. Academic Press. ISBN 978-0-12-352651-9. ^ a b c d e f Holleman, Arnold F.; Wiberg, Egon; Wiberg, Nils (1985). "Arsen". Lehrbuch der Anorganischen Chemie (in German) (91–100 ed.). Walter de Gruyter. pp. 675–681. ISBN 978-3-11-007511-3. ^ Madelung, Otfried (2004). Semiconductors: data handbook. Birkhäuser. pp. 410–. ISBN 978-3-540-40488-0. ^ Chisholm, Hugh, ed. (1911). "Arsenic" . Encyclopædia Britannica. 2 (11th ed.). Cambridge University Press. pp. 651–654. ^ Uher, Ctirad (2001). "Chapter 5 Skutterudites: Prospective novel thermoelectrics". Recent Trends in Thermoelectric Materials Research I: Skutterudites: Prospective novel thermoelectrics. Semiconductors and Semimetals. 69. pp. 139–253. doi:10.1016/S0080-8784(01)80151-4. ISBN 978-0-12-752178-7. ^ Institut National de Recherche et de Sécurité (2000). "Fiche toxicologique nº 53: Trihydrure d'arsenic" (PDF). Archived from the original (PDF) on 26 November 2006. Retrieved 6 September 2006. ^ "Arsenic: arsenic(II) sulfide compound data". WebElements.com. Archived from the original on 11 December 2007. Retrieved 10 December 2007. ^ "Kalgoorlieite". Mindat. Hudson Institute of Mineralogy. 1993–2017. Retrieved 2 September 2017. ^ Tanaka, A. (2004). "Toxicity of indium arsenide, gallium arsenide, and aluminium gallium arsenide". Toxicology and Applied Pharmacology. 198 (3): 405–11. doi:10.1016/j.taap.2003.10.019. PMID 15276420. ^ Ossicini, Stefano; Pavesi, Lorenzo; Priolo, Francesco (1 January 2003). Light Emitting Silicon for Microphotonics. ISBN 978-3-540-40233-6. Retrieved 27 September 2013. ^ Din, M. B.; Gould, R. D. (1998). High field conduction mechanism of the evaporated cadmium arsenide thin films. ICSE'98. 1998 IEEE International Conference on Semiconductor Electronics. Proceedings (Cat. No.98EX187). p. 168. doi:10.1109/SMELEC.1998.781173. ISBN 978-0-7803-4971-1. ^ Ellison, Hank D. (2007). Handbook of chemical and biological warfare agents. CRC Press. ISBN 978-0-8493-1434-6. ^ Girard, James (2010). Principles of Environmental Chemistry. Jones & Bartlett Learning. ISBN 978-0-7637-5939-1. ^ Somani, Satu M. (2001). Chemical warfare agents: toxicity at low levels. CRC Press. ISBN 978-0-8493-0872-7. ^ a b Matschullat, Jörg (2000). "Arsenic in the geosphere — a review". The Science of the Total Environment. 249 (1–3): 297–312. Bibcode:2000ScTEn.249..297M. doi:10.1016/S0048-9697(99)00524-0. PMID 10813460. ^ Brooks, William E. "Mineral Commodity Summaries 2007: Arsenic" (PDF). United States Geological Survey. Archived (PDF) from the original on 17 December 2008. Retrieved 25 November 2008. ^ a b Edelstein, Daniel L. "Mineral Commodity Summaries 2016: Arsenic" (PDF). United States Geological Survey. Retrieved 1 July 2016. ^ a b Brooks, William E. "Minerals Yearbook 2007: Arsenic" (PDF). United States Geological Survey. Archived (PDF) from the original on 17 December 2008. Retrieved 8 November 2008. ^ Whelan, J. M.; Struthers, J. D.; Ditzenberger, J. A. (1960). "Separation of Sulfur, Selenium, and Tellurium from Arsenic". Journal of the Electrochemical Society. 107 (12): 982–985. doi:10.1149/1.2427585. ^ a b Harper, Douglas. "arsenic". Online Etymology Dictionary. Retrieved 15 May 2010. ^ Bentley, Ronald; Chasteen, Thomas G. (2002). "Arsenic Curiosa and Humanity". The Chemical Educator. 7 (2): 51–60. doi:10.1007/s00897020539a. ^ Holmyard John Eric (2007). Makers of Chemistry. Read Books. ISBN 978-1-4067-3275-7. ^ Vahidnia, A.; Van Der Voet, G. B.; De Wolff, F. A. (2007). "Arsenic neurotoxicity – a review". Human & Experimental Toxicology. 26 (10): 823–32. doi:10.1177/0960327107084539. PMID 18025055. ^ Lechtman, H. (1996). "Arsenic Bronze: Dirty Copper or Chosen Alloy? A View from the Americas". Journal of Field Archaeology. 23 (4): 477–514. doi:10.2307/530550. JSTOR 530550. ^ Charles, J. A. (1967). "Early Arsenical Bronzes-A Metallurgical View". American Journal of Archaeology. 71 (1): 21–26. doi:10.2307/501586. JSTOR 501586. ^ (Comte), Antoine-François de Fourcroy (1804). A general system of chemical knowledge, and its application to the phenomena of nature and art. pp. 84–. ^ "Display Ad 48 -- no Title". The Washington Post (1877-1922). Proquest Historical Newspapers. 13 February 1898. ^ Turner, Alan (1999). "Viewpoint: the story so far: An overview of developments in UK food regulation and associated advisory committees". British Food Journal. 101 (4): 274–283. doi:10.1108/00070709910272141. ^ Hawksley, Lucinda (2016). Bitten by Witch Fever: Wallpaper & Arsenic in the Victorian Home. New York: Thames & Hudson. ^ Lanman, Susan W. (2000). "Colour in the Garden: 'Malignant Magenta'". Garden History. 28 (2): 209–221. doi:10.2307/1587270. JSTOR 1587270. ^ Holton, E. C. (1926). "Insecticides and Fungicides". Industrial & Engineering Chemistry. 18 (9): 931–933. doi:10.1021/ie50201a018. ^ Murphy, E. A.; Aucott, M. (1998). "An assessment of the amounts of arsenical pesticides used historically in a geographical area". Science of the Total Environment. 218 (2–3): 89–101. Bibcode:1998ScTEn.218...89M. doi:10.1016/S0048-9697(98)00180-6. ^ Marlatt, C. L. (1897). Important Insecticides: Directions for Their Preparation and Use. p. 5. ^ Kassinger, Ruth (20 April 2010). Paradise Under Glass: An Amateur Creates a Conservatory Garden. ISBN 978-0-06-199130-1. ^ Rahman, F. A.; Allan, D. L.; Rosen, C. J.; Sadowsky, M. J. (2004). "Arsenic availability from chromated copper arsenate (CCA)-treated wood". Journal of Environmental Quality. 33 (1): 173–80. doi:10.2134/jeq2004.0173. PMID 14964372. ^ Lichtfouse, Eric (2004). "Electrodialytical Removal of Cu, Cr and As from Threaded Wood". In Lichtfouse, Eric; Schwarzbauer, Jan; Robert, Didier (eds.). Environmental Chemistry: Green Chemistry and Pollutants in Ecosystems. Berlin: Springer. ISBN 978-3-540-22860-8. ^ Mandal, Badal Kumar; Suzuki, K. T. (2002). "Arsenic round the world: a review". Talanta. 58 (1): 201–235. doi:10.1016/S0039-9140(02)00268-0. PMID 18968746. ^ Peryea, F. J. (20–26 August 1998). Historical use of lead arsenate insecticides, resulting in soil contamination and implications for soil remediation. 16th World Congress of Soil Science. Montpellier, France. Archived from the original on 7 December 2008. ^ "Trace Elements in Soils and Plants, Third Edition". CRC Press. Archived from the original on 21 August 2016. Retrieved 2 August 2016. ^ Nachman, Keeve E.; Graham, Jay P.; Price, Lance B.; Silbergeld, Ellen K. (2005). "Arsenic: A Roadblock to Potential Animal Waste Management Solutions". Environmental Health Perspectives. 113 (9): 1123–1124. doi:10.1289/ehp.7834. PMC 1280389. PMID 16140615. ^ "Arsenic" (PDF). Agency for Toxic Substances and Disease Registry. Section 5.3, p. 310. ^ Bottemiller, Helena (26 September 2009). "Bill Introduced to Ban Arsenic Antibiotics in Feed". Food Safety News. Retrieved 10 January 2011. ^ a b Staff (8 June 2011). "Questions and Answers Regarding 3-Nitro (Roxarsone)". U.S. Food and Drug Administration. Retrieved 21 September 2012. ^ Gray, Theodore (3 April 2012). "Arsenic". In Gray, Theodore; Mann, Nick (eds.). Elements: A Visual Exploration of Every Known Atom in the Universe. Hachette Books. ISBN 978-1579128951. ^ "Phar Lap arsenic claims premature: expert". ABC News-AU. 23 October 2006. Retrieved 14 June 2016. ^ Gibaud, Stéphane; Jaouen, Gérard (2010). Arsenic – based drugs: from Fowler's solution to modern anticancer chemotherapy. Topics in Organometallic Chemistry. 32. pp. 1–20. Bibcode:2010moc..book....1G. doi:10.1007/978-3-642-13185-1_1. ISBN 978-3-642-13184-4. ^ Huet, P. M.; Guillaume, E.; Cote, J.; Légaré, A.; Lavoie, P.; Viallet, A. (1975). "Noncirrhotic presinusoidal portal hypertension associated with chronic arsenical intoxication". Gastroenterology. 68 (5 Pt 1): 1270–1277. doi:10.1016/S0016-5085(75)80244-7 (inactive 8 March 2019). PMID 1126603. ^ Antman, Karen H. (2001). "The History of Arsenic Trioxide in Cancer Therapy". The Oncologist. 6 (Suppl 2): 1–2. doi:10.1634/theoncologist.6-suppl_2-1. PMID 11331433. ^ Jennewein, Marc; Lewis, M. A.; Zhao, D.; Tsyganov, E.; Slavine, N.; He, J.; Watkins, L.; Kodibagkar, V. D.; O'Kelly, S.; Kulkarni, P.; Antich, P.; Hermanne, A.; Rösch, F.; Mason, R.; Thorpe, Ph. (2008). "Vascular Imaging of Solid Tumors in Rats with a Radioactive Arsenic-Labeled Antibody that Binds Exposed Phosphatidylserine". Journal of Clinical Cancer. 14 (5): 1377–1385. doi:10.1158/1078-0432.CCR-07-1516. PMC 3436070. PMID 18316558. ^ Bagshaw, N. E. (1995). "Lead alloys: Past, present and future". Journal of Power Sources. 53 (1): 25–30. Bibcode:1995JPS....53...25B. doi:10.1016/0378-7753(94)01973-Y. ^ Joseph, Günter; Kundig, Konrad J. A; Association, International Copper (1999). "Dealloying". Copper: Its Trade, Manufacture, Use, and Environmental Status. pp. 123–124. ISBN 978-0-87170-656-0. ^ Nayar (1997). The Metals Databook. p. 6. ISBN 978-0-07-462300-8. ^ "Blister Agents". Code Red – Weapons of Mass Destruction. Retrieved 15 May 2010. ^ Westing, Arthur H. (1972). "Herbicides in war: Current status and future doubt". Biological Conservation. 4 (5): 322–327. doi:10.1016/0006-3207(72)90043-2. ^ Westing, Arthur H. (1971). "Forestry and the War in South Vietnam". Journal of Forestry. 69: 777–783. ^ Timbrell, John (2005). "Butter Yellow and Scheele's Green". The Poison Paradox: Chemicals as Friends and Foes. Oxford University Press. ISBN 978-0-19-280495-2. ^ Cross, J. D.; Dale, I. M.; Leslie, A. C. D.; Smith, H. (1979). "Industrial exposure to arsenic". Journal of Radioanalytical Chemistry. 48 (1–2): 197–208. doi:10.1007/BF02519786. ^ Guruswamy, Sivaraman (1999). "XIV. Ammunition". Engineering Properties and Applications of Lead Alloys. CRC Press. pp. 569–570. ISBN 978-0-8247-8247-4. ^ Davis, Joseph R; Handbook Committee, ASM International (1 August 2001). "Dealloying". Copper and copper alloys. p. 390. ISBN 978-0-87170-726-0. ^ "Arsenic Supply Demand and the Environment". Pollution technology review 214: Mercury and arsenic wastes: removal, recovery, treatment, and disposal. William Andrew. 1993. p. 68. ISBN 978-0-8155-1326-1. ^ Stolz, John F.; Basu, Partha; Santini, Joanne M.; Oremland, Ronald S. (2006). "Arsenic and Selenium in Microbial Metabolism". Annual Review of Microbiology. 60: 107–30. doi:10.1146/annurev.micro.60.080805.142053. PMID 16704340. ^ Mukhopadhyay, Rita; Rosen, Barry P.; Phung, Le T.; Silver, Simon (2002). "Microbial arsenic: From geocycles to genes and enzymes". FEMS Microbiology Reviews. 26 (3): 311–25. doi:10.1111/j.1574-6976.2002.tb00617.x. PMID 12165430. ^ Santini, J. M.; Sly, L. I.; Schnagl, R. D.; Macy, J. M. (1 January 2000). "A New Chemolithoautotrophic Arsenite-Oxidizing Bacterium Isolated from a Gold Mine: Phylogenetic, Physiological, and Preliminary Biochemical Studies". Applied and Environmental Microbiology. 66 (1): 92–97. doi:10.1128/aem.66.1.92-97.2000. ISSN 0099-2240. PMC 91790. ^ Kulp, T. R; Hoeft, S. E.; Asao, M.; Madigan, M. T.; Hollibaugh, J. T.; Fisher, J. C.; Stolz, J. F.; Culbertson, C. W.; Miller, L. G.; Oremland, R. S. (2008). "Arsenic(III) fuels anoxygenic photosynthesis in hot spring biofilms from Mono Lake, California". Science. 321 (5891): 967–970. Bibcode:2008Sci...321..967K. doi:10.1126/science.1160799. PMID 18703741. Lay summary – Chemistry World, 15 August 2008. ^ Erb, T. J.; Kiefer, P.; Hattendorf, B.; Günther, D.; Vorholt, J. A. (2012). "GFAJ-1 is an Arsenate-Resistant, Phosphate-Dependent Organism". Science. 337 (6093): 467–70. Bibcode:2012Sci...337..467E. doi:10.1126/science.1218455. PMID 22773139. ^ Uthus E.O. (1992). "Evidency for arsenical essentiality". Environ Geochem Health. 14 (2): 55–8. doi:10.1007/BF01783629. PMID 24197927. ^ Uthus E.O. (1994) "Arsenic essentiality and factors affecting its importance", pp. 199–208 in Chappell W.R, Abernathy C.O, Cothern C.R. (eds.) Arsenic Exposure and Health. Northwood, UK: Science and Technology Letters. ^ Baccarelli, A.; Bollati, V. (2009). "Epigenetics and environmental chemicals". Current Opinion in Pediatrics. 21 (2): 243–251. doi:10.1097/MOP.0b013e32832925cc. PMC 3035853. PMID 19663042. ^ Nicholis, I.; Curis, E.; Deschamps, P.; Bénazeth, S. (2009). "Arsenite medicinal use, metabolism, pharmacokinetics and monitoring in human hair". Biochimie. 91 (10): 1260–7. doi:10.1016/j.biochi.2009.06.003. PMID 19527769. ^ Lombi, E.; Zhao, F.-J. ; Fuhrmann, M.; Ma, L. Q.; McGrath, S. P. (2002). "Arsenic Distribution and Speciation in the Fronds of the Hyperaccumulator Pteris vittata". New Phytologist. 156 (2): 195–203. doi:10.1046/j.1469-8137.2002.00512.x. JSTOR 1514012. ^ Sakurai, Teruaki Sakurai (2003). "Biomethylation of Arsenic is Essentially Detoxicating Event". Journal of Health Science. 49 (3): 171–178. doi:10.1248/jhs.49.171. ^ Reimer, K. J.; Koch, I.; Cullen, W.R. (2010). Organoarsenicals. Distribution and transformation in the environment. Metal Ions in Life Sciences. 7. pp. 165–229. doi:10.1039/9781849730822-00165. ISBN 978-1-84755-177-1. PMID 20877808. ^ Bentley, Ronald; Chasteen, T. G. (2002). "Microbial Methylation of Metalloids: Arsenic, Antimony, and Bismuth". Microbiology and Molecular Biology Reviews. 66 (2): 250–271. doi:10.1128/MMBR.66.2.250-271.2002. PMC 120786. PMID 12040126. ^ Cullen, William R.; Reimer, Kenneth J. (1989). "Arsenic speciation in the environment". Chemical Reviews. 89 (4): 713–764. doi:10.1021/cr00094a002. ^ "Case Studies in Environmental Medicine (CSEM) Arsenic Toxicity Exposure Pathways" (PDF). Agency for Toxic Substances & Disease Registry. Retrieved 15 May 2010. ^ "Arsenic in Food: FAQ". 5 December 2011. Retrieved 11 April 2010. ^ a b c Arsenic. The Agency for Toxic Substances and Disease Registry (2009). ^ Meharg, Andrew (2005). Venomous Earth – How Arsenic Caused The World's Worst Mass Poisoning. Macmillan Science. ISBN 978-1-4039-4499-3. ^ Henke, Kevin R. (28 April 2009). Arsenic: Environmental Chemistry, Health Threats and Waste Treatment. p. 317. ISBN 978-0-470-02758-5. ^ Lamm, S. H.; Engel, A.; Penn, C. A.; Chen, R.; Feinleib, M. (2006). "Arsenic cancer risk confounder in southwest Taiwan data set". Environ. Health Perspect. 114 (7): 1077–82. doi:10.1289/ehp.8704. PMC 1513326. PMID 16835062. ^ Kohnhorst, Andrew (2005). "Arsenic in Groundwater in Selected Countries in South and Southeast Asia: A Review". J Trop Med Parasitol. 28: 73. Archived from the original on 10 January 2014. ^ "Arsenic in drinking water threatens up to 60 million in Pakistan". Science | AAAS. 23 August 2017. Retrieved 11 September 2017. ^ "Arsenic in Drinking Water: 3. Occurrence in U.S. Waters" (PDF). Archived from the original (PDF) on 7 January 2010. Retrieved 15 May 2010. ^ Welch, Alan H.; Westjohn, D. B.; Helsel, Dennis R.; Wanty, Richard B. (2000). "Arsenic in Ground Water of the United States: Occurrence and Geochemistry". Ground Water. 38 (4): 589–604. doi:10.1111/j.1745-6584.2000.tb00251.x. ^ Knobeloch, L. M.; Zierold, K. M.; Anderson, H. A. (2006). "Association of arsenic-contaminated drinking-water with prevalence of skin cancer in Wisconsin's Fox River Valley". J. Health Popul Nutr. 24 (2): 206–13. hdl:1807/50099. PMID 17195561. ^ "In Small Doses:Arsenic". The Dartmouth Toxic Metals Superfund Research Program. Dartmouth College. ^ Courtney, D.; Ely, Kenneth H.; Enelow, Richard I.; Hamilton, Joshua W. (2009). "Low Dose Arsenic Compromises the Immune Response to Influenza A Infection in vivo". Environmental Health Perspectives. 117 (9): 1441–7. doi:10.1289/ehp.0900911. PMC 2737023. PMID 19750111. ^ Klassen, R. A.; Douma, S. L.; Ford, A.; Rencz, A.; Grunsky, E. (2009). "Geoscience modeling of relative variation in natural arsenic hazard in potential in New Brunswick" (PDF). Geological Survey of Canada. Archived from the original (PDF) on 2 May 2013. Retrieved 14 October 2012. ^ Ferreccio, C.; Sancha, A. M. (2006). "Arsenic exposure and its impact on health in Chile". J Health Popul Nutr. 24 (2): 164–75. hdl:1807/50095. PMID 17195557. ^ Chu, H. A.; Crawford-Brown, D. J. (2006). "Inorganic arsenic in drinking water and bladder cancer: a meta-analysis for dose-response assessment". Int. J. Environ. Res. Public Health. 3 (4): 316–22. doi:10.3390/ijerph2006030039. PMID 17159272. ^ "Arsenic in drinking water seen as threat – USATODAY.com". USA Today. 30 August 2007. Retrieved 1 January 2008. ^ Gulledge, John H.; O'Connor, John T. (1973). "Removal of Arsenic (V) from Water by Adsorption on Aluminum and Ferric Hydroxides". J. American Water Works Assn. 65 (8): 548–552. doi:10.1002/j.1551-8833.1973.tb01893.x. ^ O'Connor, J. T.; O'Connor, T. L. "Arsenic in Drinking Water: 4. Removal Methods" (PDF). Archived from the original (PDF) on 7 January 2010. ^ "In situ arsenic treatment". insituarsenic.org. Retrieved 13 May 2010. ^ Radloff, K. A.; Zheng, Y.; Michael, H. A.; Stute, M.; Bostick, B. C.; Mihajlov, I.; Bounds, M.; Huq, M. R.; Choudhury, I.; Rahman, M.; Schlosser, P.; Ahmed, K.; Van Geen, A. (2011). "Arsenic migration to deep groundwater in Bangladesh influenced by adsorption and water demand". Nature Geoscience. 4 (11): 793–798. Bibcode:2011NatGe...4..793R. doi:10.1038/ngeo1283. PMC 3269239. PMID 22308168. ^ Yavuz, Cafer T.; Mayo, J. T.; Yu, W. W.; Prakash, A.; Falkner, J. C.; Yean, S.; Cong, L.; Shipley, H. J.; Kan, A.; Tomson, M.; Natelson, D.; Colvin, V. L. (2005). "Low-Field Magnetic Separation of Monodisperse Fe3O4 Nanocrystals". Science. 314 (5801): 964–967. doi:10.1126/science.1131475. PMID 17095696. ^ Meliker, J. R.; Wahl, R. L.; Cameron, L. L.; Nriagu, J. O. (2007). "Arsenic in drinking water and cerebrovascular disease, diabetes mellitus, and kidney disease in Michigan: A standardized mortality ratio analysis". Environmental Health. 6: 4. doi:10.1186/1476-069X-6-4. PMC 1797014. PMID 17274811. ^ Tseng, Chin-Hsiao; Tai, Tong-Yuan; Chong, Choon-Khim; Tseng, Ching-Ping; Lai, Mei-Shu; Lin, Boniface J.; Chiou, Hung-Yi; Hsueh, Yu-Mei; Hsu, Kuang-Hung; Chen, C. J. (2000). "Long-Term Arsenic Exposure and Incidence of Non-Insulin-Dependent Diabetes Mellitus: A Cohort Study in Arseniasis-Hyperendemic Villages in Taiwan". Environmental Health Perspectives. 108 (9): 847–51. doi:10.1289/ehp.00108847. PMC 2556925. PMID 11017889. ^ Newspaper article (in Hungarian) published by Magyar Nemzet on 15 April 2012. ^ Goering, P.; Aposhian, H. V.; Mass, M. J.; Cebrián, M.; Beck, B. D.; Waalkes, M. P. (1999). "The enigma of arsenic carcinogenesis: Role of metabolism". Toxicological Sciences. 49 (1): 5–14. doi:10.1093/toxsci/49.1.5. PMID 10367337. ^ Hopenhayn-Rich, C.; Biggs, M. L.; Smith, A. H.; Kalman, D. A.; Moore, L. E. (1996). "Methylation study of a population environmentally exposed to arsenic in drinking water". Environmental Health Perspectives. 104 (6): 620–628. doi:10.1289/ehp.96104620. PMC 1469390. PMID 8793350. ^ Smith, A. H.; Arroyo, A. P.; Mazumder, D. N.; Kosnett, M. J.; Hernandez, A. L.; Beeris, M.; Smith, M. M.; Moore, L. E. (2000). "Arsenic-induced skin lesions among Atacameño people in Northern Chile despite good nutrition and centuries of exposure" (PDF). Environmental Health Perspectives. 108 (7): 617–620. doi:10.1289/ehp.00108617. PMC 1638201. PMID 10903614. ^ Smedley, P. L. (2002). "A review of the source, behaviour and distribution of arsenic in natural waters". Applied Geochemistry. 17 (5): 517–568. Bibcode:2002ApGC...17..517S. doi:10.1016/S0883-2927(02)00018-5. ^ Zeng Zhaohua, Zhang Zhiliang (2002). "The formation of As element in groundwater and the controlling factor". Shanghai Geology 87 (3): 11–15. ^ Zheng, Y; Stute, M; Van Geen, A; Gavrieli, I; Dhar, R; Simpson, H.J; Schlosser, P; Ahmed, K.M (2004). "Redox control of arsenic mobilization in Bangladesh groundwater". Applied Geochemistry. 19 (2): 201–214. Bibcode:2004ApGC...19..201Z. doi:10.1016/j.apgeochem.2003.09.007. ^ Thomas, Mary Ann (2007). "The Association of Arsenic With Redox Conditions, Depth, and Ground-Water Age in the Glacial Aquifer System of the Northern United States". U.S. Geological Survey, Virginia. pp. 1–18. ^ Bin, Hong (2006). "Influence of microbes on biogeochemistry of arsenic mechanism of arsenic mobilization in groundwater". Advances in Earth Science. 21 (1): 77–82. ^ Johnson, D. L; Pilson, M. E. Q (1975). "The oxidation of arsenite in seawater". Environmental Letters. 8 (2): 157–171. doi:10.1080/00139307509437429. PMID 236901. ^ Cherry, J. A. (1979). "Arsenic species as an indicator of redox conditions in groundwater". Contemporary Hydrogeology - the George Burke Maxey Memorial Volume. Developments in Water Science. 12. pp. 373–392. doi:10.1016/S0167-5648(09)70027-9. ISBN 9780444418487. ^ Cullen, William R; Reimer, Kenneth J (1989). "Arsenic speciation in the environment". Chemical Reviews. 89 (4): 713–764. doi:10.1021/cr00094a002. ^ Oremland, Ronald S. (2000). "Bacterial dissimilatory reduction of arsenate and sulfate in meromictic Mono Lake, California". Geochimica et Cosmochimica Acta. 64 (18): 3073–3084. Bibcode:2000GeCoA..64.3073O. doi:10.1016/S0016-7037(00)00422-1. ^ Reese Jr., Robert G. "Commodity Summaries 2002: Arsenic" (PDF). United States Geological Survey. Archived (PDF) from the original on 17 December 2008. Retrieved 8 November 2008. ^ "Chromated Copper Arsenate (CCA)". US Environmental Protection Agency. Retrieved 15 October 2018. ^ "Is CCA treated pine Safe? - Softwoods". www.softwoods.com.au. Retrieved 24 February 2017. ^ Townsend, Timothy G.; Solo-Gabriele, Helena (2 June 2006). Environmental Impacts of Treated Wood. CRC Press. ISBN 9781420006216. ^ Saxe, Jennifer K.; Wannamaker, Eric J.; Conklin, Scott W.; Shupe, Todd F.; Beck, Barbara D. (1 January 2007). "Evaluating landfill disposal of chromated copper arsenate (CCA) treated wood and potential effects on groundwater: evidence from Florida". Chemosphere. 66 (3): 496–504. Bibcode:2007Chmsp..66..496S. doi:10.1016/j.chemosphere.2006.05.063. ISSN 0045-6535. PMID 16870233. ^ BuildingOnline. "CCA Treated Wood Disposal | Wood Preservative Science Council | Objective, Sound, Scientific Analysis of CCA". www.woodpreservativescience.org. Retrieved 16 June 2016. ^ "TRI Releases Map". Toxmap.nlm.nih.gov. Archived from the original on 20 March 2010. Retrieved 23 March 2010. ^ TOXNET – Databases on toxicology, hazardous chemicals, environmental health, and toxic releases. Toxnet.nlm.nih.gov. Retrieved 2011-10-24. ^ Jain, C. K.; Singh, R. D. (2012). "Technological options for the removal of arsenic with special reference to South East Asia". Journal of Environmental Management. 107: 1–8. doi:10.1016/j.jenvman.2012.04.016. PMID 22579769. ^ Goering, P. (2013). "Bioremediation of arsenic-contaminated water: recent advances and future prospects". Water, Air, & Soil Pollution. 224 (12): 1722. Bibcode:2013WASP..224.1722B. doi:10.1007/s11270-013-1722-y. ^ Goering, P. (2015). "Anaerobic arsenite oxidation with an electrode serving as the sole electron acceptor: A novel approach to the bioremediation of arsenic-polluted groundwater". Journal of Hazardous Materials. 283: 617–622. doi:10.1016/j.jhazmat.2014.10.014. PMID 25464303. ^ "Arsenic". Sigma Aldrich. 15 October 2018. Retrieved 15 October 2018. ^ Arsenic Rule. U.S. Environmental Protection Agency. Adopted 22 January 2001; effective 23 January 2006. ^ a b c "Supporting Document for Action Level for Arsenic in Apple Juice". Fda.gov. Retrieved 21 August 2013. ^ a b Lawmakers Urge FDA to Act on Arsenic Standards. Foodsafetynews.com (2012-02-24). Retrieved 2012-05-23. ^ "A Homeowner's Guide to Arsenic in Drinking Water". New Jersey Department of Environmental Protection. Retrieved 21 August 2013. ^ NIOSH Pocket Guide to Chemical Hazards. "#0038". National Institute for Occupational Safety and Health (NIOSH). ^ NIOSH Pocket Guide to Chemical Hazards. "#0039". National Institute for Occupational Safety and Health (NIOSH). ^ Kotz, Deborah (14 September 2011). "Does apple juice have unsafe levels of arsenic? – The Boston Globe". Boston.com. Retrieved 21 August 2013. ^ Morran, Chris. "Consumer Reports Study Finds High Levels Of Arsenic & Lead In Some Fruit Juice". consumerist.com. ^ "Arsenic contamination of Bangladeshi paddy field soils: implications for rice contribution to arsenic consumption : Nature News". Nature.com. 22 November 2002. Retrieved 21 August 2013. ^ "Tainted wells pour arsenic onto food crops". New Scientist. 6 December 2002. Retrieved 21 August 2013. ^ Peplow, Mark (2 August 2005). "US rice may carry an arsenic burden". Nature News. doi:10.1038/news050801-5 (inactive 8 March 2019). ^ "Rice as a source of arsenic exposure". ^ "EHP – Rice Consumption and Urinary Arsenic Concentrations in U.S. Children". Ehp.niehs.nih.gov. Archived from the original on 12 November 2014. Retrieved 21 August 2013. ^ "High Levels Of Arsenic Found In Rice". NPR. 2 March 2012. Retrieved 21 August 2013. ^ a b c "Arsenic in Your Food | Consumer Reports Investigation". Consumerreports.org. 1 November 2012. Retrieved 21 August 2013. ^ "FDA Looks for Answers on Arsenic in Rice". Fda.gov. 19 September 2012. Retrieved 21 August 2013. ^ "Arsenic in Rice". Fda.gov. Retrieved 21 August 2013. ^ "Questions & Answers: FDA's Analysis of Arsenic in Rice and Rice Products". Fda.gov. 21 March 2013. Retrieved 21 August 2013. ^ a b "Arsenic in Rice: What You Need to Know". UC Berkeley Wellness. Retrieved 3 September 2014. ^ "Arsenic". RTECS. National Institute for Occupational Safety and Health (NIOSH). ^ a b Hughes, Michael F. (2002). "Arsenic toxicity and potential mechanisms of action". Toxicology Letters. 133 (1): 1–16. doi:10.1016/S0378-4274(02)00084-X. PMID 12076506. ^ "OSHA Arsenic". United States Occupational Safety and Health Administration. Archived from the original on 12 October 2007. Retrieved 8 October 2007. ^ Croal, Laura R.; Gralnick, Jeffrey A.; Malasarn, Davin; Newman, Dianne K. (2004). "The Genetics of Geochemisty". Annual Review of Genetics. 38: 175–206. doi:10.1146/annurev.genet.38.072902.091138. PMID 15568975. ^ Giannini, A. James; Black, Henry Richard; Goettsche, Roger L. (1978). The Psychiatric, Psychogenic and Somatopsychic Disorders Handbook. New Hyde Park, NY: Medical Examination Publishing Co. pp. 81–82. ISBN 978-0-87488-596-5. ^ The Tox Guide for Arsenic (2007). The US Agency for Toxic Substances and Disease Registry.